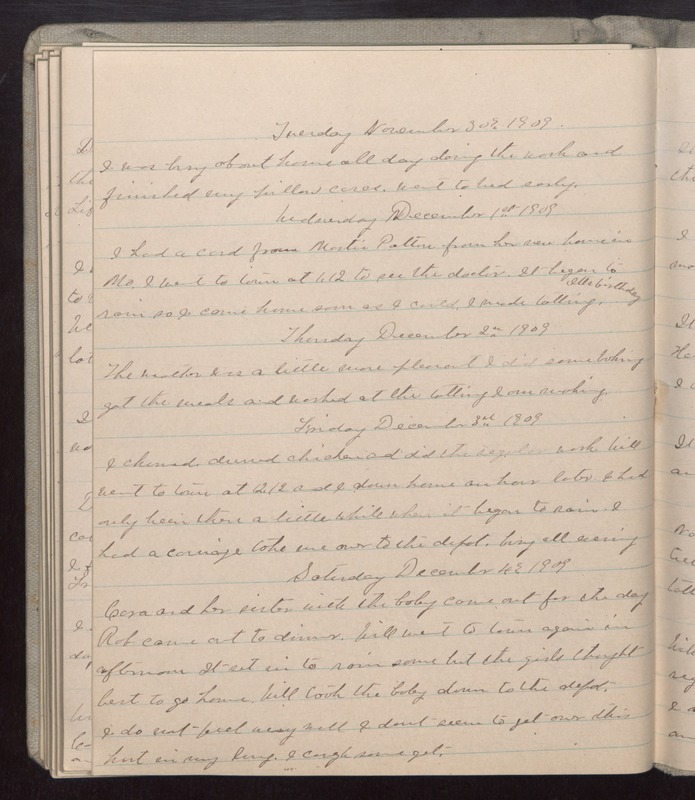 Tuesday November 30th 1909 I was busy about house all day doing the wash and finished my pillow cases. went to bed early. Wednesday December 1st 1909 I had a card from Martie Patton from her new house in Mo. I went to town at 1.12 to see the doctor. It began to rain so I came home soon as I could. I made tatting. Otts birthday Thursday December 2nd 1909 The weather was a little more pleasant I did some baking got the meals and worked at the tatting I am making. Friday December 3rd 1909 I churned dressed chickens and did the regular work. Will went to town at 12.12 and I down home an hour later. I had only been there a little while when it began to rain. I had a carriage take me over to the depot. busy all evening Saturday December 4th 1909 Cora and her sister with the baby came out for the day Rob came out to dinner. Will went to town again in afternoon It set in to rain some but the girls thought best to go home. Will took the baby down to the depot I do not feel very well I dont seem to get over this hurt in my lung. I cough some yet.